Last year, Google launched a feature called Google Ads Personalisation. This is a collection of information and settings within your Google account, that controls and manages what ads you see when browsing the web with Google (as many of us do) and on websites that are partnered with google and their advertising network. By default, this feature is switched on for all accounts, though it remains customisable if you know where to look. With ads being quite prevalent across many websites these days, it can be useful to make sure that when you do see ads that they are suited to your own interests. 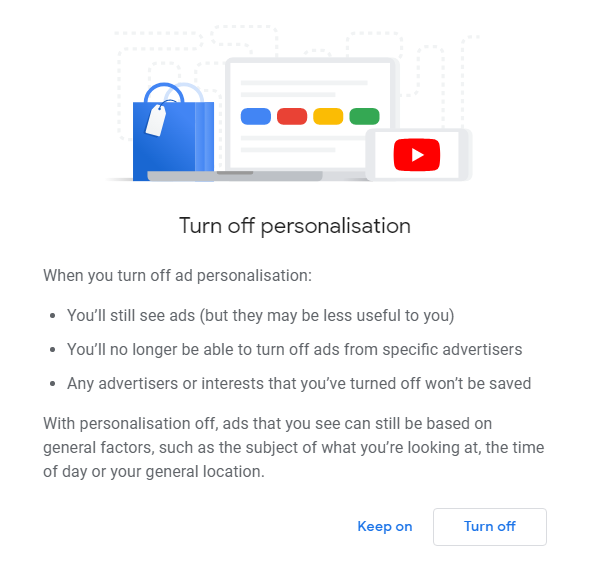 Irrelevant ads can be quite a nuisance while browsing, so we’ll take a look at what you can do with your ads settings, as well as other options such as turning off Google Ads Personalisation. 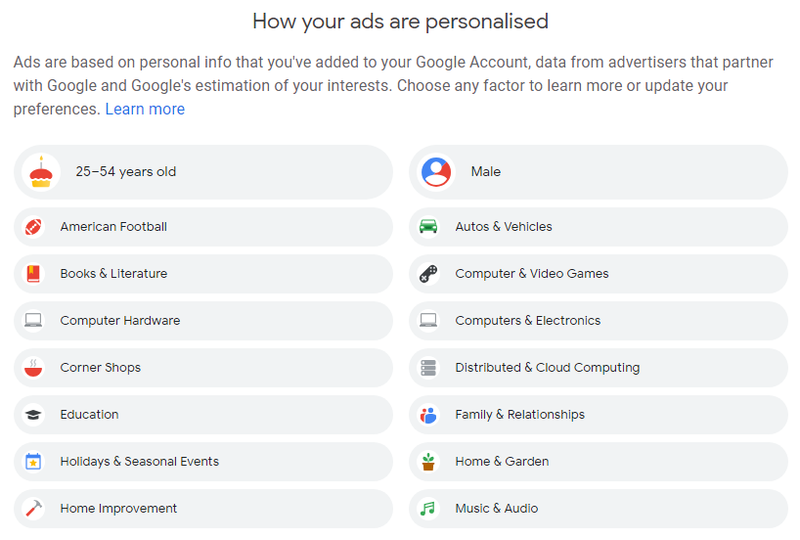 Google Ads Personalisation keeps non-specific demographic data stored about you on your Google account. Based on your settings, browsing history, and other data, information is gathered over time to approximate your interests and show you relevant ads. By entering the Ads Settings, you can see this demographic data for yourself, and evaluate how well Google thinks it knows you. It’s not an exact science of course, so there are bound to be a few strange associations in there. What you search for and browse for on the web may not always reflect your own personal interests, such as needing to do a quick search on behalf of someone else, or simply for specific details about an event that may not be of particular interest. The Ads Settings remember information for quite some time, so a single search long ago may still flag you as having a particular interest in one field. Your demographics and interests are listed in Ads Settings. Now that you know what demographics and topics you are displayed ads for, you can implement some control over the ads that you see. Selecting any topic within your own Ads Settings, will allow you to switch off ads for that particular interest. 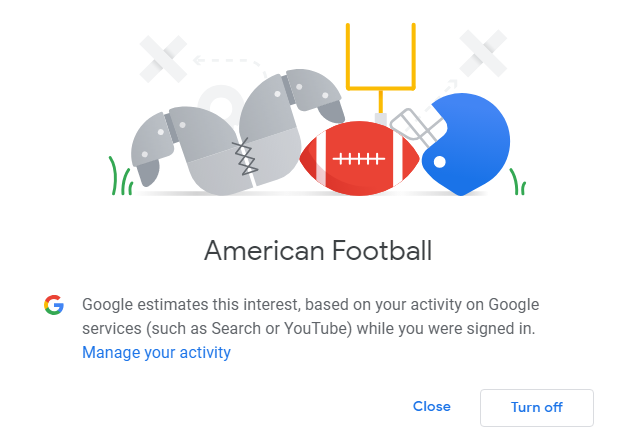 If you have no desire to see ads about American Football for example, pressing the turn off button will no longer display associated ads to you, simple as that! Not interested in American Football? Switch off related ads at the click of a button. Anything you switch off will be displayed beneath your interests in a separate section, so you can switch them back on at a later date if you wish to. By looking through interests and topics associated with your Google account, you can limit what kinds of ads are shown to you. For some circumstances or personal preference, it can be beneficial to have no personalisation of ads at all. This can be done easily by switching off Google Personalised Ads. You can disable Google Ads Personalisation here. It should be noted however, that this does not mean that ads will not display at all. Ads will still appear, though they’ll be much more generalised. Ads will also display from any relevant topic based on other factors, so all kinds of ads are possible, nothing can be directly excluded with Google Ads Personalisation switched off. It also doesn’t extend to ads outside of Google and their advertising network, so other networks and websites may still show personalised ads. Additionally, opting out of Google Personalised Ads will not keep you opted out if you decide to clear your browser cookies, though by using a browser extension ( Interest-Based Ads Opt Out Extension ) from Google, this setting can be kept active, including across multiple users.